I just quickly wanted to share some deals going on for two really great reads, in case you are looking for your next read! First, Matched by Ally Condie is available for only $2.99 TODAY ONLY! Grab it and start the trilogy before the final book, Reached, comes out this fall! Click here to read my review! Second, The Girl of Fire and Thorns, my favorite fantasy read of 2011, is also available for only $2.99 for a limited time! Definitely grab this one and read it before the sequel, The Crown of Embers, comes out (I'm so excited!). Also, an exclusive short story, "The Shadow Cats," comes out on Tuesday, so be sure to download that as well! I've already got that on pre-order--I just love Rae Carson's writing! 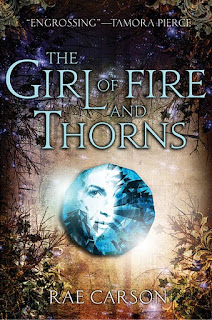 Click here to read my review of The Girl of Fire and Thorns. I really need to read The Girl of Fire and Thrones. Perhaps I will take advantage of that deal.